We are happy to take children on our walks. 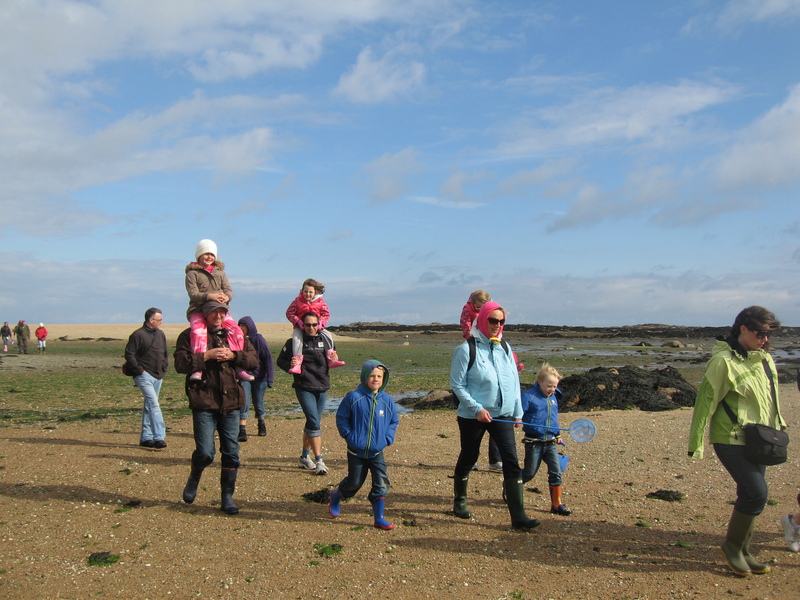 Most children love the huge “zoo” of marine mini-beasts and spot lots of fascinating creatures. As parent you can judge best, whether your youngsters may find the time rather long or are happy to walk up to 3 miles/4.5 km. There are lots of little stops on the way to explore a puddle, collect shells (small plastic bags come in very handy for that) and pebbles. Once we reach Seymour or Icho Tower children (as adults) love to drink and munch something having a little break, so ensure you bring some refreshments. As young people get cold quickly protective clothing (including hats) for the weather conditions are important to keep them walking happily. Hats are especially important in sunny weather as are light t-shirts covering shoulders and arms. We walk across pools and channels and we will get wet up to the knees. Please take into consideration that wet jeans can be uncomfortably rubbing on children’s legs. Footwear must be suitable for walking over uneven, wet, and sometimes slippery surfaces. Shoes should be comfortable and well fitting and ideally with some sort of ankle support. Trainers are fine. Wellington boots need to be well fitting, as wellington boots can become uncomfortable on a walk of 2 hours or more. Crocs and socks – this may sound fuddy-duddy, but socks prevent you from getting your skin rubbed by bits of sand. In general we do not recommend crocs as they don’t give enough support to the feet, especially for children.